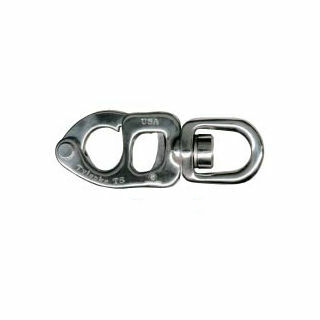 Tylaska T5 Snap Shackles are perfect for small boat applications requiring high strength and low weight. They have a breaking strength of 5,000 lbs and weigh just 2.2 ounces in the standard bail configuration. Ideal for J-24s, Mumm 30s and similar boats. SB - Standard Bails provide ample room for attaching a line while keeping weight and overall shackle length to a minimum. Ideal for halyards and sheets.